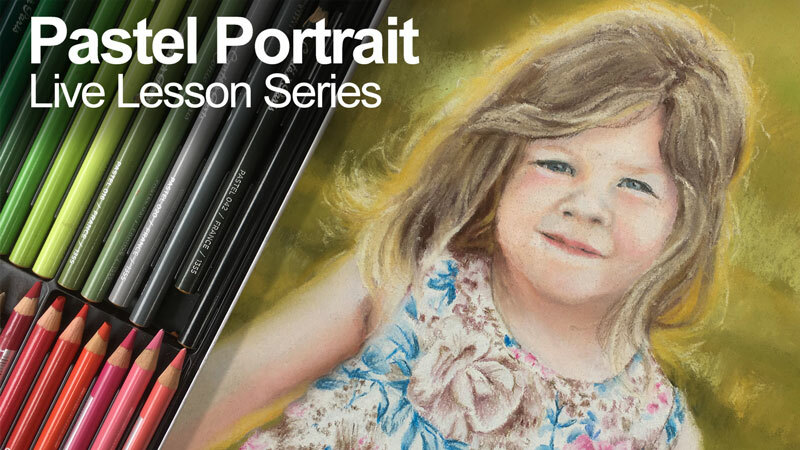 A five-part lesson series on drawing a portrait with pastels. Each step of the process from start to finish is covered. Learn how to transfer the contours quickly and easily. Layer and mix skin tones and build up depth with color. Details are handled with pastel pencils before adding a strong sense of light to complete the image. When will you be working on this one again? This series is over. You can watch all of the videos in the series by clicking on the tabs out to the left of the video. There are five one-hour long lessons. Can’t wait to have a go, who is the little girl in photo? Hey Mat, I just watched the first lesson and I loved it and Leart a lot about image transfer. I have a question regarding that, what kind of paper did you use for it? Also can I use regular A4 printing paper for this? Yes, regular typing paper or printing paper is acceptable. This is what was used to transfer the image in this lesson. Do you put any kind of sealer on the pastel portrait, and when framing is acid free need to be covering the picture? Some folks like to use fixative to protect the art. I usually don’t use any fixative since it can change the tone of the colors. Yes, always look for acid free mat board – most of it is already – when framing your art. Hi Matt, am really loving the course and especially these live lessons. I’m learning so much! This is a beautiful picture of a beautiful little girl. I thought it was your daughter as she looks so much like you, then at the end someone said she was your niece. I’ve started a pastel drawing of my baby nephew since finding this live lesson. I’m really enjoying myself and following all your tips. My main issue is with getting the colours right for skin tones. I used dark umber for the darker tones and, as you say, it looks much better than black. Thanks again for giving me an outlet in my rehab from a chronic illness I’ve suffered many years and motivating me to keep going with my drawing!